the sense that it's overshadowed by the music itself. The Queen II album was one of those pivotal moments that just nailed me to the wall. "He's probably one of the top identifiable guitar players, even more so than Beck, Page, and Clapton. 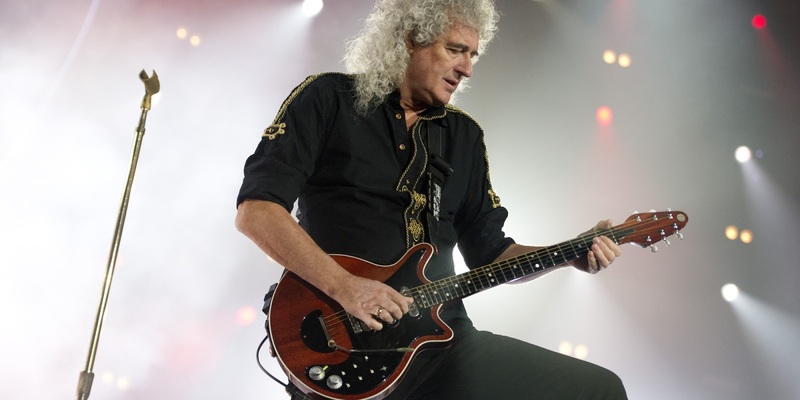 They're all so identifiable, but Brian May has such a tone in his head and in his fingers. It speaks volumes. His contribution to orchestrated guitars is unprecedented. There was nothing like it before him. To me, it was like when Edward Van Halen came along and reshaped the sound of electric guitar. That's what I heard in Brian May's playing. It's something that's inherent in the brain of the guitar player. "I went down and he brought me up on the stage, and he let me play the guitar-the guitar that he built with his dad [the "Red Special"]. I couldn't even believe that I was touching this instrument! He was so kind and so warm, and for who? This kid, you know? And I played his guitar, and it sounded like Steve Vai. Then when he played it, it sounded just like Brian May. It was very apparent to me that his tone is in his fingers and his head. "He's a class act from head to toe, and it shows in his playing. I can listen to any player and pantomime their sound, but I can't do Brian May. He's just walking on higher ground."